1" x 1" x 2.5"
Basic pendulums with positive polarization don't emit any harmful radiation, Powered by the gemstone. Isis Its shape symbolizes the cross of life. It has a high dowsing sensitivity and sends as well as receives energy. Isis is activated mentally and radiates all frequencies of the visual spectrum. Used to check food, medications and herbs, to search on maps and plans, or as a therapeutic tool. Self-clearing. The most powerful healing pendulum available. Sends double-strength healing energy directly along its central axis. Clockwise, it energizes the body; counterclockwise, it calms the nervous system. Relieves pain and strengthens the immune system. It emits white, gold and violet, the most healing colours of the spectrum. It is effective even when used by beginners and inexperienced healers. Self-clearing. Osiris strongly emits green minus energy indefinitely to help treat cancer and bacterial and viral illnesses. Because this energy is dangerous to healthy tissue, this pendulum should only be used by skilled dowsers and must be disconnected when not in use. Must be cleared. Similar to Isis, but different shape. For more experienced dowsers. Must be disconnected when not in use. Self-clearing. These pendulums have a cavity to contain a 'witness', a sample of the substance to be found or tested. They are used for searching, for diagnosis, to determine the dosage of medication and to determine sensitivity to food. Mermet is general purpose pendulum with cavity. Must be cleared. Two Mermets, one on top of the other. They have a uniquely high dowsing sensitivity and respond strongly to mental commands. Self-clearing. Double Mermet opens at the top, Double Mermet German opens in the middle. A small pendulum inside a larger one. The small one can be used as a basic pendulum for simple search work. The larger one allows for outdoor work by adding more weight. Its cavity makes it useful for witness work. Must be cleared. For minerals. Contains a special plexiglas insert for the witness, to minimize the influence of the pendulum's own material. Also used to energize personal gemstones. Simplified version of the Universal pendulum. The shaft is segmented into wavelengths of different colours. The ring can be moved to various positions to create an imaginary cone that emits energy at the wavelength of the chosen colour. Very handy for changing the vibration of any room or house. Must be cleared. Emits the same vibration as the Atlantis ring. The pendulum strengthens and directs the vibration of the symbol. It is used for healing and protection, and reinforces intuition. Basic pendulums with positive polarization don't emit any harmful radiation to the practitioner. They are excellent for beginners. They can be used to test food and herbs, to read charts and to find underground water streams. Must be cleared. Used mostly in chromotherapy, since its lack of polarization allows it to send any wavelength of colour energy. For therapeutic use only. Must be cleared. 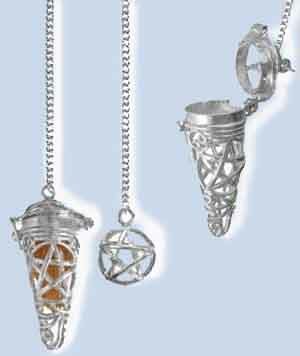 Due to its counterclockwise spiral design, this pendulum concentrates and spirals energy. Very precise; ideal for diagnosis and astrology. Recommended for highly skilled dowsers. Must be cleared. Wonderful diagnosis tool due to its shape. It can precisely pinpoint the weak spot and send energy directly to it. Must be cleared.